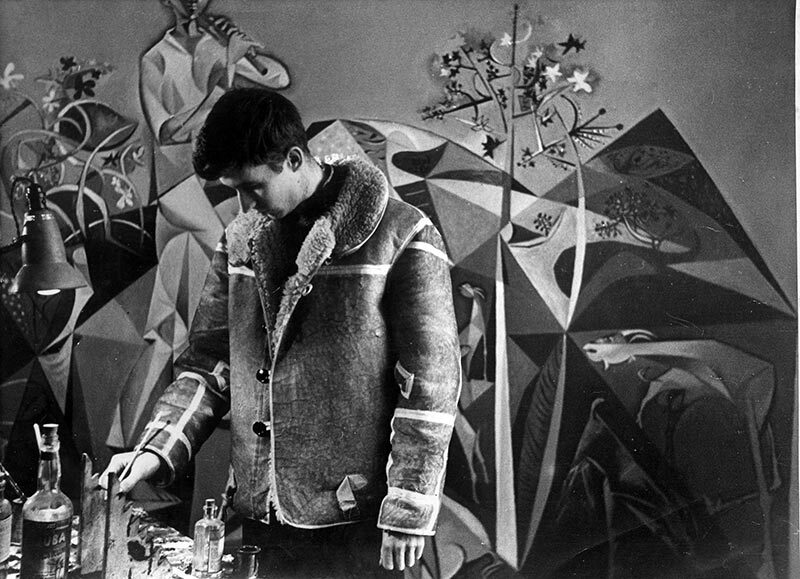 The last time an exhibition surveyed the scope of John Craxton’s career was at the Whitechapel Gallery in 1967. Welded to the figurative in an age of Abstract Expressionism, sworn to sincerity when Pop Art was applying a varnish of gleaming cynicism, Craxton’s paintings bemused the critics. For John Russell, writing in the Sunday Times, ‘these elaborate compositions, heaped thin and high, push hard against the handicap of happiness’. The Fitzwilliam Museum’s exhibition ‘A World of Private Mystery: John Craxton RA (1922–2009)’ now seeks to reassert the relevance of a painter who was persistently punished for his assertion that life was more important than art. Bringing together around 60 works, including extraordinary pieces from the collections of individuals such as Peter Pears and Tacita Dean, the exhibition ranges from brooding, adolescent interpretations of the pastoral, to the world of Bacchic celebration he discovered in Crete. Despite experiencing early success in Britain under the patronage of ICA founder Peter Watson, Craxton made Greece his home from 1960 onwards. Here, far from the cold climate of academic analysis and the hated epithet ‘neo-Romantic’, he translated his early love for the art of Blake and Palmer into a language ornate with vibrant sensuality, made kaleidoscopic by Cubism, cast in the colours of Byzantine mosaics, and outlined with a patterned, linear touch quite his own. This was no diluted memory of Romanticism; with the last drops of melancholy dissolved in Mediterranean light, Craxton depicted his living Arcadia. Craxton never achieved the same heights of fame as his one-time friend and later enemy, Lucian Freud, with whom he shared a house and a delight in painting dead animals (sources tell of a dead monkey, stored in their oven when Kenneth Clark came to tea). However, Craxton’s reputation has been steadily rising, championed by the writer of his monograph, Ian Collins, and popularised by David Attenborough – one of Craxton’s charmed coterie. 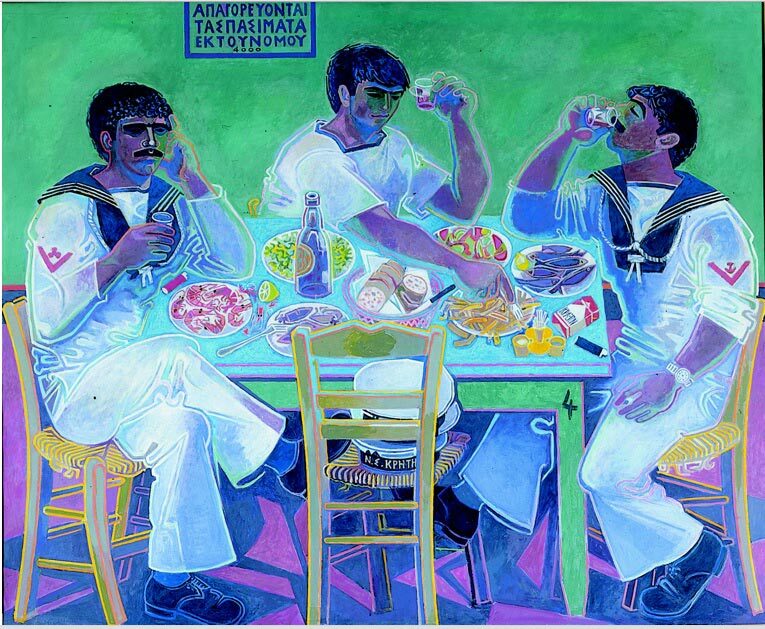 In 2011, smalls displays of Craxton’s work were shown at Tate Britain, Bonhams and Osborne Samuel among other galleries, and May 2012 brought further exposure with a Christie’s auction of the estate of Patrick Leigh Fermor, whose books featured Craxton’s iconic cover illustrations. The same month, prices for Craxton’s work peaked in the Sotheby’s sale of Sleeping Fisherman (1948) at £277,250, trumping the artist’s former sales by roughly a third. In 2009, Craxton’s obituary in The Telegraph speculated: ‘His unfashionably happy later work may come to be valued more highly in the future, but it is probably for his early work that he is likely to be best remembered.’ Not if this exhibition has anything to do with it. 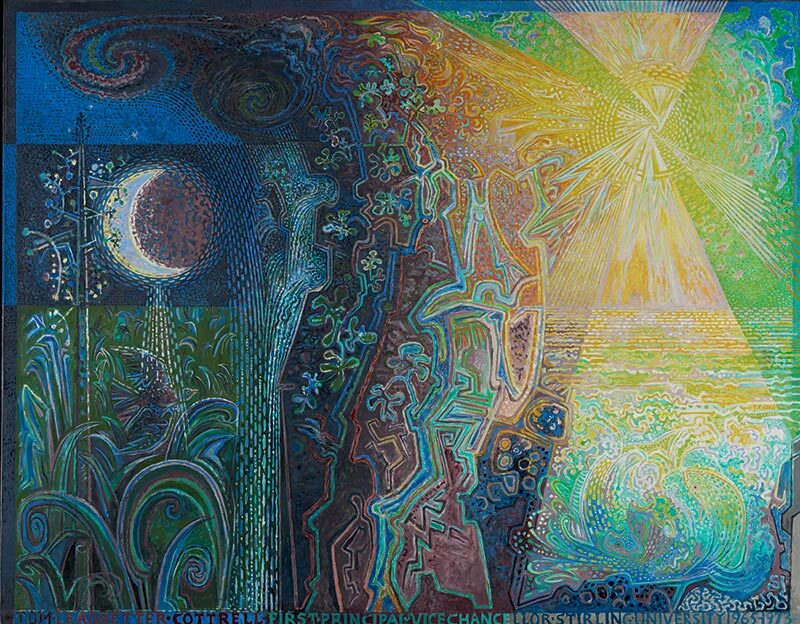 Although it pays due attention to the early imagined landscapes (traumatic, compressed worlds of pulsating vegetation and fearful beasts, products of an artist who punned his name with Kraken) the true weight of the exhibition rests in the larger, later canvases – in the ecstatic pantheism of Landscape with the Elements (1973–5), or the tessellated calm of Landscape, Hydra (1963–7). In its aim to revitalise Craxton’s reputation, the exhibition revels in such paradox. There is an almost moral dimension to the choice of quotation emblazoned across the gallery walls: ‘In a life of reality my imagination really works’. It speaks of indulgent escapism giving way to genuine freedom. Yet, for Craxton, perhaps a line could be drawn between the two. The melancholic youth in Poet in Landscape (1941) reads Blake, whose words Craxton was to recall throughout his later works: ‘the great and golden rule of art, as well as of life, is…that the more distinct, sharp and wiry the bounding line, the more perfect the work of art’. Craxton’s paintings may not achieve perfection, but there is a linear definition to their vision, pointing towards the unbounded infinite. ‘A World of Private Mystery: John Craxton RA (1922–2009)’ is at the Fitzwilliam Museum, Cambridge, until 20 April 2014. ‘A World of Private Mystery: John Craxton RA (1922–2009)’ at the Fitz has been such a positive and enlightening exhibition delighting visitors with Craxton’s unseen ingenuity. His meticulous detail and unique portrayal of dazzling sunshine is unmissable, and his depiction of young lads and many goats…you will be sorry you missed it.